CND Rhythm & Heat Collection photos, swatches! I'm still in my winter coat, so spring hasn't quite sprung for me yet, but I'm hoping some new polishes will help me forget that I'm still chilly on the willy. Three of the six shades available from CND's Rhythm & Heat Collection arrived in the letterbox for me to play with and not a moment too soon. And yes, I got a bit arty party with the photos! Sugar Cane is a minty pistachio green shade that makes me crave mint chocolate chip ice cream. Funny that eh? I could've craved a healthy green smoothie but no, ice cream all the way. Two coats gives a nicely opaque finish that's bright and spring appropriate. Now, be back in a second while I locate me some ice cream ok bye. Shells in the sand is a peachy polish of joy! It's got a sheer formula though, kind of like a jelly polish that's see through instead of being creamy and opaque. I applied two coats for the photos but could've done three for maximum opacity. With the two coats, I could kind of see my nails through parts of it, but as I said, the third coat would've fixed that right up. This shade would be gorgeous with a tan, so I'll have to learn how to put fake tan on properly and then I'll be sorted. Splash of Teal isn't a shade I'd usually reach for but this one is stunning! It's rich, bright and vibrant, all the things I'd like to be myself.... Two coats of this jewel toned beauty gave me full opacity on the nails and of the three shades, this was my favourite on. It's the most forgiving of the three meaning because it's darker and more pigmented, mistakes are less obvious, unless you forget you've polish on and need to go to the loo or need to scratch yourself. That gets me every time! I've spoken so many times about the Vinylux range and how much I love the Vinylux Weekly Top Coat. It's one of two polish collections that I can get a full week out of before chipping begins and that's unheard of for me! The CND Vinylux polishes and top coat are €11.95 each and you can find your nearest stockist at www.lovecnd.com and it's available on dolledup.ie too! I am a lady of a certain age now. And I say lady in the sense of when kids are acting up in front of me, their Mums now say "Stop that now or The Lady will put you out". Not The Girl.... No, I'm The Lady. But sure listen, we're all getting older and I've about 89% accepted that. Over the years I've tried to look after my skin and I think it's worked out well because when I say to people that I'm 40, their reactions make me believe that A) they've been working on their method acting and are saying what they think I want to hear, or B) I've been minding my skin. But now is not the time to get complacent. And that's where Olay comes in! For the past few weeks, I've been trialling Olay Anti-Wrinkle Firm & Lift Day Cream as only a beauty blogger can - with notes, photos and thorough investigation of my face on a daily basis. The brand ran a trial last month with 100 women trying Olay Anti-Wrinkle Firm & Lift Day Cream for 14 days. Each woman reported back on their findings and a huge 84% said they'd recommend it to a friend. I love a good study and was excited to see if I'd be part of the 84%! Aimed at those between the ages of 30 and 60, Olay Anti-Wrinkle Firm & Lift Day Cream promises to help lift and tighten the skin. And as I am in the thick of that age range and am firmly in the whole "age is just a number" camp, I just want to slow down the ageing process a bit. I know it's going to happen to me, but slow and steady wins the actual race am I right? With ingredients including vitamin B3 to help maintain the skin's moisture barrier, Pro vitamin B5 to help with the skin's suppleness and overall elasticity, my beloved glycerin which forms a protective moisture barrier on the skin and vitamin E which we all know helps moisturise the skin and protects it from free radical damage, I knew Olay were speaking my language and my face was ready for action. It has quite thick texture in the pot, but when applied, this lightly scented cream absorbs into my skin quickly and dries to a matte finish, making my slap dash job of applying foundation while brushing my hair all the easier. I'm a brilliant multi tasker and my morning routine is always a good 5-10 minutes behind schedule so having something that works quickly and effectively makes me want to use it every day. I'm sure I'm not alone in wanting to see quick results when it comes to skincare. For me when using Olay Anti-Wrinkle Firm & Lift Day Cream, I first noticed the change in how my skin felt. 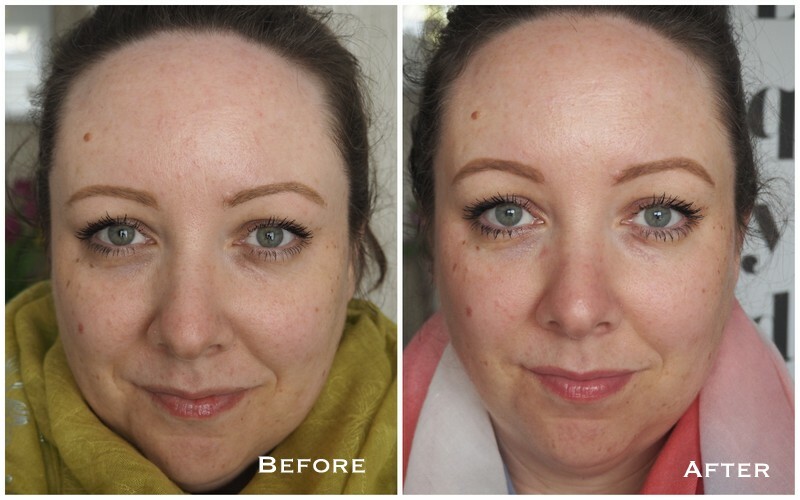 My cheeks felt plumper without feeling tight and there was a definite improvement in my skin tone all round. It took care of the few dry patches on my forehead and cheeks and as the weeks have gone on, my skin is smooth, soft and firmer. I'm lucky in that I don't have a huge amount of fine lines yet despite having a massive forehead and a ridiculously expressive face and I'd like to keep it like that for the next while thanks very much. I know what it's like to be standing in front of a load of face creams and get completely overwhelmed. There's such a massive selection on the market now that they all start to look the same. And I know I might be showing my age even more now (but not through my skin right?) but Olay is a brand that so many of us know and trust. They know we want results, we don't want to spend a fortune and we want to be able to walk into a chemist or shop and pick up something we recognise and know we can rely on! If you're looking to get cracking with a proper skincare routine, then Olay's Anti-Wrinkle Firm & Lift Day Cream won't break the bank. And there's a whole heap of products in the Firm & Lift range if you really wanted to get stuck into a new routine for your skin! Olay Anti-Wrinkle Firm & Lift Day Cream is on shelves now and will only set you back €14. Grand job altogether! Clarins Skin Illusion Blushes review with photos, swatches! Every spring, I can always rely on Clarins to help me look fresh faced when I feel anything but. They just get it. And the Skin Illusion Blushes are no exception. There are three in the collection and I'm hoping they'll bring out more, ooh or maybe a highlight version! Anyway, back to the blushes at hand. They've made the transition from winter to a bit less winter much easier and sure look at them, they're so dinky! So we're talking cheek stamp blushes, the idea being when you open them up, one half houses the blush and the other half has the sponge applicator which picks up the pigment and boom, your cheeks are only gorgeous. You probably thought I'd be all over the coral shade, Luminous Coral, and you'd be right. I can't imagine a time when that won't be the case. Me and my peachy corals forever! It's a beautiful warm shade that will be on my face for months and will come on holidays with me too. Luminous Pink is also stunning and is a lovely addition to a spring makeup routine. Think dainty, ladylike cheeks. I haven't tried Golden Havana properly yet and think it'll suit me better when I've a bit of a tan, but it's got a great colour payoff if dusky brown toned pinks are your jam. Now to the application. Being a perfectly round sponge applicator, you need to mind that you don't just bonk it onto your cheeks and hope for the best. It's definitely better to pat it lightly over your cheeks being careful not to slide the sponge over the skin or else it'll look demented and we don't want to look demented. Ok maybe sometimes we do. On a Monday. Without even trying. I've perfected the method after learning the hard way that a light hand is definitely needed and the colour is easily buildable if you need a little more. By patting the sponge lightly over your cheeks, you'll be grand. If you're not, get a blush brush, soften it all and try again. The texture is silky smooth and it never looks powdery or like you're wearing makeup, rather looking like your skin has a natural flush of colour. The mirror on the lid is a nice idea but my face is way too big to be able to use it properly. I need to see everything at once and assess the situation to see if less really is more, or more is very much more. There's very rarely a day in my life where I don't have to go over my blush with my foundation brush because I've lost the run of myself. If you're using a brush to apply the product onto the cheeks, I'd recommend pressing the bristles into the product rather than swirling, otherwise it's going to get messy. Or use the sponge to apply the blush onto your cheeks and blend the edges with a brush. No matter how funny you think it might be, don't try and be gas and apply two circles on your cheeks and get people to call you Aunt Sally for the craic. You'll forget it's there and go about your day wondering why people are looking at you wonky. I'm absolutely loving these and even better is that they're a very reasonable €20 and are on counters now! Do we think the Mammies might like one of these for Mother's Day maybe?! Benefit GALifornia blush review, photos, swatches! I haven't been this excited about a Benefit blush in ages and any product that makes me emit a noise when I first open it is always promising. (I ooohed in case you were wondering). Benefit GALifornia is going to make the long awaited transition from winter to spring a bit easier, so even if it's grey and dreary outside, a much needed hit of colour in the form of makeup will make have to do! Now take a second and just look at it... Do you ever just look at a piece of makeup and think "Yeah, you're gonna make me happy"? Yeah me neither. Shut up you. Now this is described as a golden pink blush, but it definitely looks more peachy/coral in the box and runs pinky/coral on me. If you've been reading the blog for a while, you'll know I don't wear pink on my cheeks that often. But give me anything peach or coral and I'm all over it. Or it's all over me. You may have heard YouTubers say that a certain product gives them life and I'm not going quite that far, but this blush gives my cheeks life. I can look miserable on the outside, feel miserable on the inside and a lick of this up my cheeks and all misery is hidden! I was hoping the gold shimmer would run throughout the whole things but sadly it's an overspray, but fear not fellow lovers of a bit of glow on the cheeks, for there's only loads of radiance beneath it. You can see the sheen in the pan and when applied on the cheeks, there's a proper "lit from within" vibe going on. While I like my T-zone to be matte, I love my cheeks to have natural radiance with a pop of colour and GALifornia delivers all of the things I want! It's lightly scented with grapefruit and vanilla and as soon as it's on my cheeks I can't smell anything which suits me. And it hasn't broken me out yet either. But you want to see what it looks like on don't you? Cue the cheesy photos of my visage. Even if I have a good swish around with my brush into the box, there's no kickback of powder and it literally glides over my skin like buttah. It feels silky smooth to apply and sits beautifully on my skin. As I have a tendency to go overboard with blush, and brows, and highlight, ok on all the things, I start off with a light coat and build it up slowly, layer by layer. I know I'm going to get so much wear out of this over this spring and summer and beyond and I will do my best not to go overboard with it. When I love something, I'm the queen of "Ok just a little bit more, a bit more, bit more, OK too much" so we'll see how this goes! Benefit GALifornia is available on Debenhams.ie from Cloud10beauty.com and Benefit counters now.